Beef and pork meatballs in chili and red pepper jelly from Rania Harris (KDKA Pittsburgh Today Live, January 2008) via instant messenger, so I hope it copies right. In a small skillet over medium heat, melt the butter. Add the onion and a pinch of salt and sweat until the onions are soft. Remove from the heat and set aside. Combine the bread and milk mixture, ground chuck, pork, egg yolks, salt and black pepper to taste, allspice, nutmeg, and onions. Blend mixture well, but don’t overwork, as the result will be a dense meatball. Roll the mixture into 1-inch meatballs. 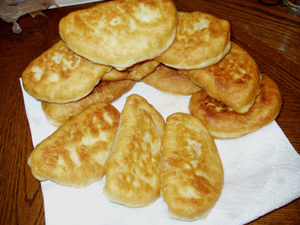 Heat enough vegetable oil to cover the bottom of an electric skillet set to 350 degrees. Dust the meatballs with flour to coat well. Add the meatballs to the skillet and fry until golden brown on all sides, about 7 to 10 minutes. Remove the meatballs to paper towels to drain. Once all of the meatballs are cooked, combine the chili sauce and the red pepper jelly in a pot and heat just to the boiling point. Carefully add the meatballs and heat gently. Remove from heat and carefully pour into a fondue pot and serve following the manufacturer’s directions. It's really a chicken and potato hot pocket. Total time: 1 hour for prep, plus 1 hour per 10 Mexi-pockets. 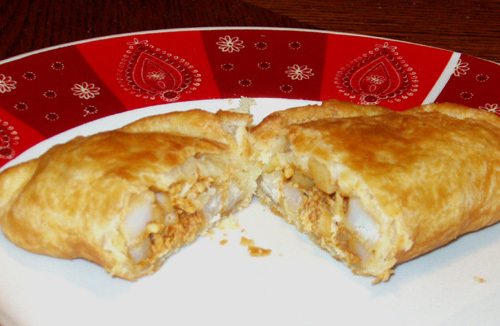 For lack of a better term, that’s what I call these little crosses between hot pockets and empanadas. Make them with or without meat, with or without flavor. I do not recommend putting cheese inside of them, as the dough tends to soak it all up. Keep in mind, all ingredients are optional; I use what I have available. That’s where I always start. My preference is to put the meat, onions, seasonings and poblano peppers in my crock-pot on low, overnight with two cups of water. Tonight, I boiled my chicken breasts with a tablespoon of lime juice, then separated and shredded the meat with two forks. Boil your diced potatoes until they’re tender, but not soft, about 5 minutes. In a skillet, fry your onions and garlic until your onions start to turn clear, about 3 minutes on med-high. 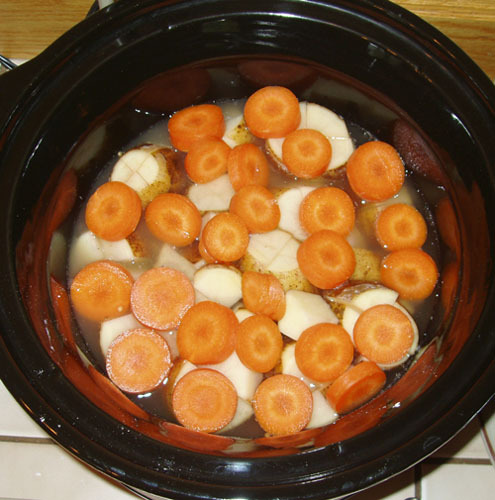 You can add any other vegetables or peppers at this time and fry them in the skillet – if you are not using a crock-pot, then I’d definitely fry all of your vegetables before putting them in your mixing bowl. Add to your vegetable mixture, mix well… or add nothing and use it as is! I like to scoop my mix into empanada shaped pastries, but you could also just make burritos or lettuce wraps. You can place your uncooked hot pockets or empanadas on a cookie sheet and freeze separately, then pile them all up in a freezer bag for later use. Or cook them all at once; they keep for up to 3 days in the refrigerator or 3 months in the freezer, and they reheat amazingly well (must be the shortening in the dough?). Total time: 1 hour, plus pasta cook time. Place meat into a large mixing bowl. Sprinkle seasonings on top of meat. Crush crackers into fine pieces across meat and seasonings. Add eggs and mix by hand for 3-5 minutes. Shape into meatballs and place in an oven safe baking dish. Cover with aluminum foil and bake for 30 minutes. Lift the edge of the aluminum foil to allow steam to escape. Bake 15 more minutes. Seen here with spaghetti, Classico’s tomato and basil sauce, and asiago cheese. Kefta with extra onions and couscous. Adapted from the Kraft Food & Family recipe for Moroccan Meatballs. COMBINE coffee, honey and cornstarch; set aside. In a large bowl, mix meat and seasonings until well blended. Shape into 24 meatballs. COOK in large nonstick skillet on medium heat 10 min. or until browned on all sides, stirring occasionally. Increase heat to medium-high. ADD onions to skillet and cook 1 minute. Add coffee mixture to skillet; stir until meatballs and onions are evenly coated. Bring just to boil. Reduce heat to medium; simmer 10 min. or until meatballs are cooked through (160°F) and sauce is thickened, stirring occasionally. Last time, served these with couscous. Bread Bible "popovers" that turned into dutch babies. I normally leave the breads and baking to JB, but one day, I was making beef stew, and I decided to make bread to go with it. I had no idea that bread took so long… so I revised my search for “something faster”. I found this super awesome looking recipe for popovers in JB’s copy of The Bread Bible, and I thought: HAH! I can do that! I followed her detailed instructions to a T, because I wanted so desperately to show off. The result is shown to the right. Completely disheartened, I turned to Alton Brown for help. Alton Brown's Popovers at the 30 minute mark. 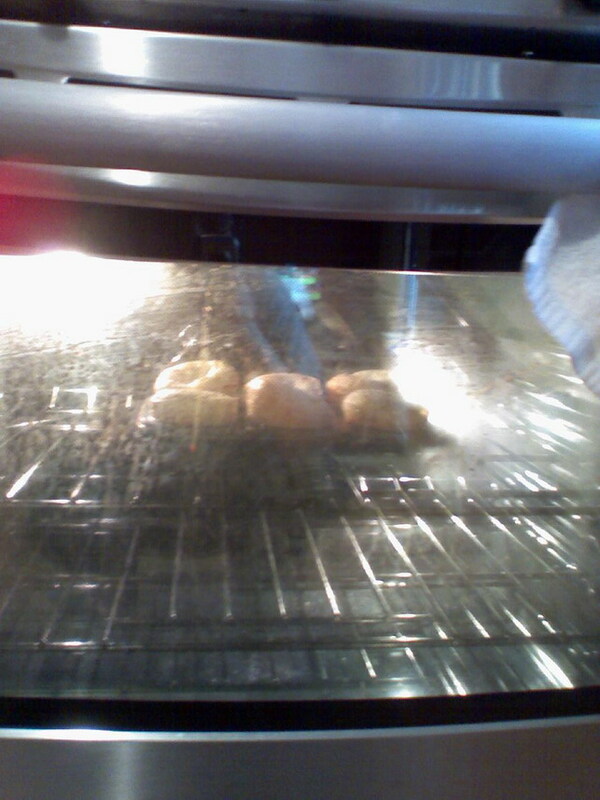 Divide the batter evenly between the cups of the popover pan, each should be about 1/3 to 1/2 full. Bake on the middle rack of the oven for 40 minutes. Remove the popovers to a cooling rack and pierce each in the top with a knife to allow steam to escape. Serve warm. The second thing to remember is – as much as your heart desires to open the oven door to check on your popovers, DO NOT OPEN THE DOOR. Just put them in there, set the timer, and walk away. Total time: 2 minutes, plus marinate and cook time. Mix them up, marinate for 20 minutes to 24 hours. This is my favorite for “I don’t know what I want to do for dinner” flavor. I can easily add something else to give it a different accent (turmeric and cumin for Indian, cumin and ancho or chipotle for Mexican, etc)… but this is the very basic. Something to keep in mind when you make any marinade: You need an acid and an oil. You can use any type of oil (peanut for Asian dishes is a neat touch), and any kind of breakdown compound (vinegar, lemon, lime, wine, etc). The purpose is to take a tough meat and make it tender. If it’s chuck roast you want to soften up, you should probably slice against the grain into small pieces and marinade for several hours. If it’s chicken, 20 minutes to 2 hours normally does the trick.